This excellent date finds Gerard Schwarz conducting pianist Eugene Istomin and the Seattle Symphony Orchestra on readings of Mozart's Concerto No. 21 in C major, K. 467 and Concerto No. 24 in C minor, K 491, recorded in 1995 at St. Thomas Center, Bothell, Washington. 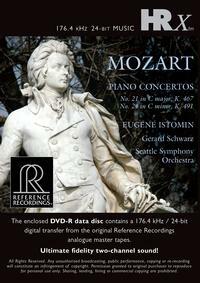 Istomin and Schwarz have performed these immortal concertos from Mozart many times and insisted on recording them in long, complete takes in order to capture the live experience. Reference Recordings Chief Engineer and Technical Director "Prof" Keith Johnson's wizardry pays large dividends in natural, high-resolution string textures and a huge, three-dimensional soundstage. Gerard Schwarz and the Seattle Symphony constitute one of the most celebrated musical marriages of our time. They have earned awards from Ovation, Musical America and Stereo Review magazines, eight Grammy nominations and two Grammy Awards. Often referred to as "the most recorded orchestra in America," the Seattle Symphony now boasts more than 50 titles in its catalog.